If you’re anything like me, your only exposure to sweet potatoes as a kid may have been mixed with a lot of butter and sugar and topped with marshmallows. And while my mom’s sweet potato casserole is totally delicious, it doesn’t do this healthy superfood justice. Sweet potatoes are considered one of the world’s healthiest foods so let’s learn all about this seasonal favorite! Brown-skinned and pock-marked, sweet potatoes are similar in shape, size, and appearance to regular baking potatoes. One thing you’ll notice is that many of them have pointed ends instead of the rounded end of white potatoes. Sweet potatoes can also be quite large—the smallest sweet potatoes are around the size of regular white baking potatoes. The largest sweet potato can be upwards of 5 pounds! When you slice into a sweet potato, you’ll notice firm, bright orange flesh. If you’re lucky enough to have a large farmer’s market nearby, you might even be able to find the more rare, purple-fleshed sweet potato. Sweet potatoes have a similar texture to white potatoes when raw; although, they do become slightly softer (and cook more quickly) than white potatoes when cooked. Cooked sweet potatoes taste starchy and slightly-sweet—similar to other fall and winter favorite veggies like butternut squash and pumpkin. If you’re looking for a healthier alternative to a white potato, the sweet potato is your answer. Sweet potatoes are one of nature’s best sources of vitamin A (clocking in at nearly 440% of your daily recommended allowance per one cup). For folks watching their blood sugar (and even those who aren’t), studies have show that even though sweet potatoes taste starchy, eating them help improve blood sugar regulation. When and where do I get them? Sweet potatoes are usually available year-round at the grocery store (in some regions, they may be labeled as “yams”, even though, technically, a yam is an entirely different vegetable). You may also be able to find them at some of the larger autumn and winter farmer’s markets. Sweet potatoes store for about 3-4 weeks in ideal conditions (cool and humid), and cooked sweet potatoes can store in the freezer for 6-12 months. How do I prepare sweet potatoes? Most folks approach sweet potatoes the same way they do white potatoes—baked sweet potatoes, sweet potato fries, and roasted sweet potato fries are all popular choices. 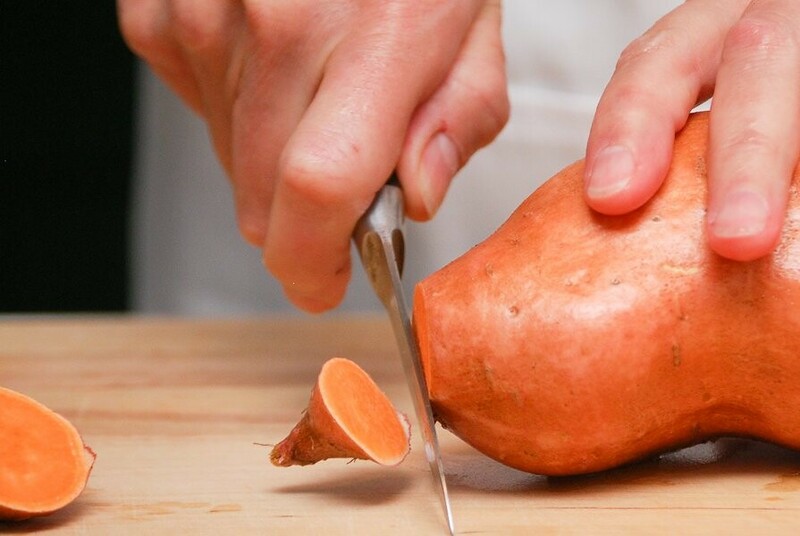 Most recipes call for peeling the sweet potato, then cutting to the desired size. For an easy side dish, peel a sweet potato, cut in bite-sized pieces, toss with olive oil, salt and pepper, and roast in a 375° oven until soft and caramelized—about 35 minutes.